There is a number of reasons that one may wish to delete their PayPal account. Closing down a PayPal account is a quick and hassle free process that can be completed in just a couple of minutes. If for some reason you need to close down your account, this tutorial will help you do so safely. Some users use the phrase ‘deactivate PayPal account‘. Deactivate often means an account can be reactivated if needed (such as a Facebook account). This is not the case with PayPal. Once an account has been deleted, it is permanently closed. 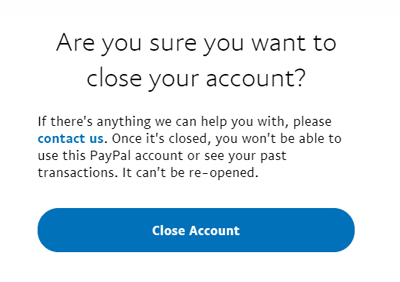 Why Would Someone Need to Close their PayPal Account? There are a handful of reasons users choose to close down their PayPal account. While it may seem like the right idea to close down your account, please note their is no cost associated with keeping it opened. You never know, one day you may decide to use PayPal again. They will not be using the account in the future. For instance they may have switched to the Stripe Payment Gateway or found a cheaper alternative. Their account has been compromised and they wish to close it down for safety reasons. They will be opening an account with a different email address. They had an account for a business that is not longer trading. Once a PayPal account is closed down it cannot be reopened meaning all the transaction history is lost. It is important to screenshot or print out your transaction history if you will need it at a later date. To delete your PayPal account you will need to be using a laptop or computer. PayPal accounts cannot be closed down from a mobile phone. If you have decided to go ahead and close down your account, before you do so ensure you collect the entirety of your PayPal balance. In specific circumstances, an account will not be allowed to be closed until issues are solved. If you still have a remaining PayPal balance, pending funds or unresolved issues you will not be able to close your account. Once the money has been transferred and the issues have been resolved, the account can be closed. How to Close Down a PayPal Account? The instructions to delete the account differ slightly depending on if your PayPal is titled as ‘personal’ or ‘business’. Follow the instructions below depending on which type of PayPal account you wish to close. Click on the Settings menu next to Log Out. Under the Account Options section, click the Close your account button. If requested, enter your bank details. Click on the Profile button next to Log Out. Click on the Profile and Settings button. At the top of the Account Settings page, you will see a Close Account button next to Account type. Click the Close account button to delete your PayPal account. What Happens after Closing a PayPal Account? Once a PayPal account has been closed down you will not be able to access it. Your history and rapport with PayPal will also be lost. 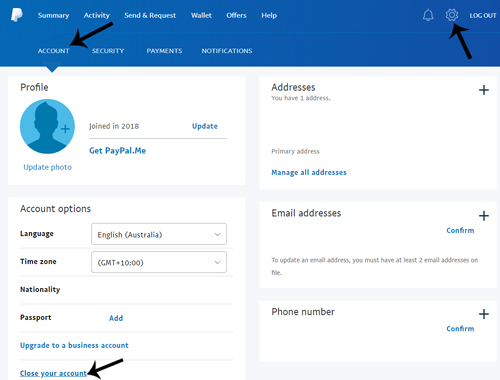 You can create a new PayPal (often using the same email address) although you will not be able to view the transaction history of the previous account. Future online payments cannot be made using the deleted account. Q: Can the Same Email (from the Closed Account) be Used for a New PayPal Account? A: Yes once you have successfully closed down a PayPal account, you can use the same email to create a new account.